Spies, soldiers, thieves and aliens. All caught in a power play between corporations and governments to control the future of our world. A future where humanity isn't the only player, and the lines aren't as clear as you think. A secret outpost of humanity has barely survived an attack by beings from another world. Now their leader has followed the last of the invaders to Earth. He must discover and stop the invader's plan.. or all of humanity will burn. 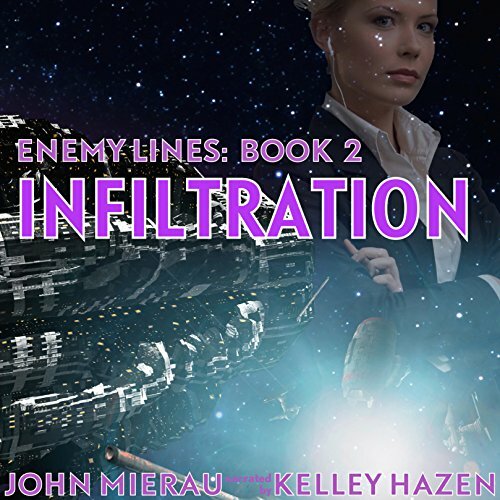 The second in the thriller/space opera series Enemy Lines pits man against a coming reckoning at alien hands... if we can survive our own eternal greed. Would you listen to Infiltration again? Why? Yes. The story is deep and intriguing. Many story lines that converge to make the whole. A smart story. What was one of the most memorable moments of Infiltration? When Jonah explains The Reckoning. It gave me chills. What does Kelley Hazen and StorytellerProductions bring to the story that you wouldn’t experience if you just read the book? Its a smart read. She knows how to tell the story and not get in the way. I love this series. Any science fiction fan will love it. The mothers of all the conspiracies. If you could sum up Infiltration in three words, what would they be? You have to like Jonah, but I like Cal's journey here. He takes being metaphorically knocked around pretty well while chasing ghosts. Have you listened to any of Kelley Hazen and StorytellerProductions ’s other performances before? How does this one compare? I have only listened to her narrate book one of this story. Subversion was very well done but I have to say Ms. Hazen seems to hit stride with the narration here; it's top notch. There is some humor here but a lot more tension, I am wound up and may not recover until the next audio book is released, or Friday happy hour; whichever comes first. Please get book one "Subversion" first, your listening experience will be enhanced.